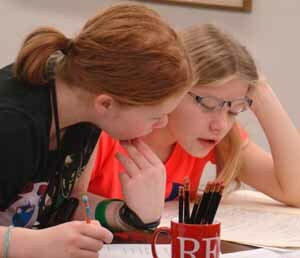 6th graders at the CAA are working with one of our partners, the downtown Davenport Library (specifically with the exceptional reference staff they have and our teachers). 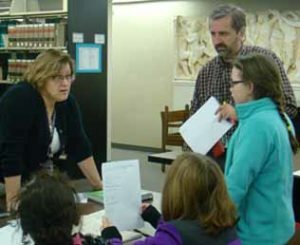 Students will discover immigration struggles and/or stories and are working together, matched by their cultural backgrounds for several Mondays (when the library is closed to the public) in the Special Collections area and in their computer classroom. The information they gather in their research, plus that on a survey filled out by family members, and their cultural folk tales, combined with others in their group into small group plays or stories and monologues. 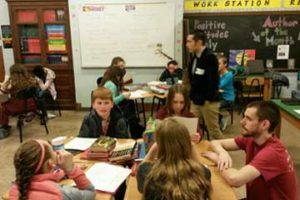 They will receive a two-day play writing workshop with their two CAA teachers up at Sudlow, given by two outstanding area theatre artists, Tyson Danner from Davenport Junior Theatre and Calvin Wo from the Moline Public School system. Pictured above are Creative Arts Academy 6th graders at Sudlow during their “Heritage” class which combines Social Studies and Language Arts. 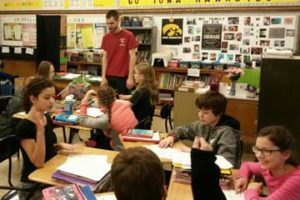 Instruction was provided by two theatre artists, Tyson Danner and Calvin Wo, who gave a two day play writing workshop for Mrs. Natasha Waite’s CAA class. In their writing segment, they made use of the data they gathered with the assistance of the geneology staff at the library on various cultures represented in the class to write group plays. The plays or vignettes were performed for the public in January. Click here to see sample videos from these plays on our Facebook page. John Deere, and the Doris and Victor Day Foundation.